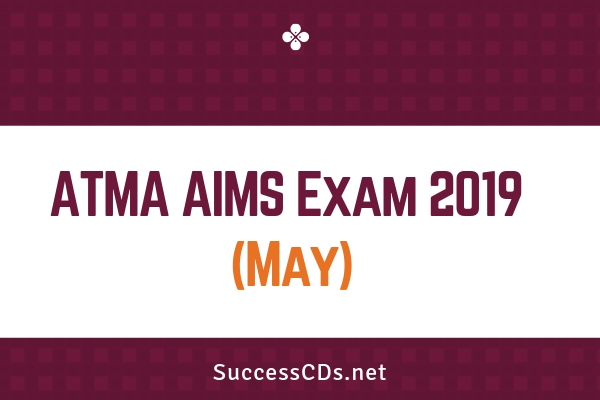 ATMA is conducted ATMA 2019 May - The Association of Indian Management Schools (AIMS) has started the registration for AIMS Test for Management Admissions (ATMA) 2019 for May 2019 Session.four to five times a year for admission to MBA/PGDM admissions to various B-schools across the country. Read the notification to know more information related to the application form of ATMA 2019. Normally, ATMA is conducted in the following Test centres: Ahmedabad (Gandhinagar), Amravati (Maharashtra), Aurangabad (Maharashtra), Beed, Bengaluru, Bhubaneswar, Bilaspur (Chhattisgarh), Chandrapur, Chennai, Coimbatore, Delhi NCR, Hyderabad / Secunderabad, Indore, Jaipur, Jalgaon, Kolhapur, Kolkata, Lucknow, Mumbai - Navi Mumbai - Thane, Nagpur, Nanded, Nashik, Patna, Pune, Raipur, Ranchi, Solapur. Interested and eligible candidates must apply online and pay application fee either through online payment or bank account transfer. Following are the three simple steps to fill ATMA 2019 application form: (ATMA 2019 Application form). The ATMA 2019 Exam Fee is Rs.1100/- + 18% GST, i.e. Rs 1298/-. Candidates can submit the fee via online payment methods only i.e. credit card, debit card, and internet banking. Once the fee is paid, the candidate will receive a system generated Personal Identification Number (PID) on his/her Mobile by SMS as well as Email. If the same is not received, the candidate can search for PID or Password by Clicking Here. Please save this PID for future reference. The same PID shall be candidate’s Login ID for Reprint of application form, Print of Admit Card as well as Result. Once the payment of Fee is successful and the PID is received, the candidate can proceed to fill the registration form by Clicking Here. Following information is required to be filled in the registration form. PID, Name, Postal Address, Email Id, Date of Birth, Mobile Number, Preferred Test City Choice, Educational Qualifications, Exact Percentage of SSC, HSC, Degree (In case the candidate is appearing, mention "NA") Postgraduate/Professional Degree if applicable, Post qualification experience, if any, and choice of Institutes for reporting ATMA Scores. Uploading Scanned Image of Candidate’s Photograph and Signature in prescribed format (Click here for the help) is necessary to complete the registration process. The registration process completes only after the Scanned image of Candidate’s Photograph and Signature is uploaded.